Calling all fashionistas–win Money, Money, Money!!! Grand Prize: One (1) Grand Prize of $10,000.00 cash. Total ARV of Grand Prize is $10,000.00. First Prizes: Three (3) First Prizes for $1,000.00 gift card each. Total ARV of all First Prizes is $3,000.00. Total Approximate Retail Value (ARV) of all prizes being offered: $13,000.00 Entries Entries must be received by January 15, 2015. Every home has one, a room that defies explanation–a catch all, a someday project. Every dorm has a room that needs extra advice on organizing a small area. Here is a sweepstakes that answers the call of both! Enter the HGTV and Bed Bath & Beyond Sweepstakes and let the renovations begin. Now, until September 7, 2010 you can enter each day for an Instant Prize of $25! And, there’s an instant Gift Card Winner EVERY HOUR. Renovations can be applied to home or dorm. Must be 18 years of age. Enter Now and Enter Often!!! Get Your Tidy Whiteys Clean! Clorox®, famous for getting your tidy whiteys clean, has a daily sweepstakes to win a Maytag® Washer and Dryer. Clorox® Regular-Bleach is giving away a MAYTAG® Performance Series High Efficiency Washer and Dryer EVERY DAY until April 11, 2010! You can earn up to 5 entries per day by playing their match the stain game. Fun game to play to wake you up from the post lunch doldrums! Plus you also get a chance to win a $2,000 weekly family wardrobe makeover. Must be 18 and resident of 48 continental U.S. states + D.C.
Tide™ has all kinds of goodies at their site including a fun contest to design a fresh look for Venus Williams for Tide Plus Febreeze, but loads of free coupons. 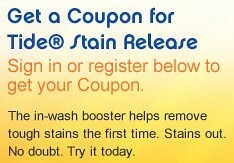 One of the latest coupons is for $3 off Tide Stain Release, an in-wash stain booster that works with your detergent. Sign-up today and Save, Save, Save! My brother and I uncovered my dad’s stash of ties from the 60’s and 70’s. To be kind, some were less than artistic–well, to be honest, some were downright ugly. What can you do with ugly ties? If you’re crafty, you can braid them into rugs, take swatches for wearable art apparel, make strips for a log cabin quilt–the possibilities are endless. 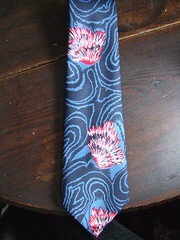 OR, you can enter the Ugly Tie Contest by Paul Fredrick on facebook and win a $500 Gift Certificate. Paul Fredrick is noted for tasteful men’s attire and the hottest trends in men’s fashion. Don’t pass up their Deals of the Week for men’s chic on the cheap extra savings! Contest is open until March 17, 2010.